The real name is Badshai Masjid which I think means the King of Mosques. 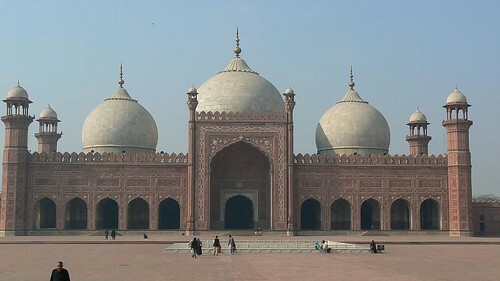 At the time this mosque was created it might have been the largest mosque in the world. Badshai Masjid could also mean the King's Mosque, but I don't think that is the intended meaning. The mosque was created some 400 years ago by the Mughal King Akbar. Apparently the cost to build the mosque was 700,000 rupees. And that was 400 years ago. I would imagine that right now when adjusting to inflation it would be equal to eleventy bajillion dollars. Key aspects of Islamic architecture are symettry and repitition. You can see how the arching door ways are repeated and how the main door way lies right in the middle.